The Macleods are thought by some to descend from the old Lords of the Isle of Man, as they began, early in the 18th Century, to add the Arms of Man to their Coat of Arms, but this is by no means conclusive as such heraldic assumptions were not uncommon in the 17th and 18th Centuries. 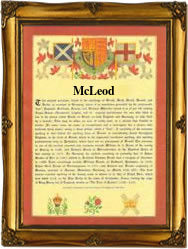 McLeod is the Anglicization of the Gaelic "MacLeoid", meaning son (Mac) of Leod, which derives from the Norse personal name "Ljotr" or "Ljot", originally a double stemmed name of which this word was the first element, probably from "ljot-ulf", ugly wolf. An interesting namebearers, listed in the "Dictionary of National Biography", were: Mary MacLeod (1569 - 1674), the Gaelic "Poetess of the Isles", whose poems were chiefly panegyrics of the MacLeods; and John McLeod (1777 - 1820), a naval surgeon and author, who was concerned in the capture of a French ship, and tried for piracy. A Coat of Arms granted to a family of the name is described thus: "Quarterly, first and fourth, blue a castle triple-towered and embattled silver masoned black windows and porch red; second and third, red three legs in armour conjoined at the upper part of the thigh proper placed in triangle and garnished and spurred gold, the arms of the Isle of Man, all within a bordure embattled gold. The first recorded spelling of the family name is shown to be that of Gillandres MacLeod, which was dated 1227, in the "Acts of Parliament of Scotland", during the reign of King Alexander 11 of Scotland, 1214 - 1249. Surnames became necessary when governments introduced personal taxation. In England this was known as Poll Tax. Throughout the centuries, surnames in every country have continued to "develop" often leading to astonishing variants of the original spelling.